Nintendo UK has stealth-dropped a new video highlighting Indie games coming to the Nintendo Switch. Most surprising of all is that three games are launching today on the Switch! They include the real-time strategy game Bad North, the mass-stealing multiplayer shooter Morphie’s Law, and the prison simulator Prison Architect. Watch the announcement video below and check out the official press releases. Nintendo of Europe has just released a video focusing on upcoming Nindie launches on the Nintendo Switch system. During the video, it was revealed that three new indie games are launching … today. Starting today, Bad North from Raw Fury, Morphies Law from Cosmoscope and Prison Architect: Nintendo Switch Editionfrom Double Eleven/Introversion Software are all available in Nintendo eShop on Nintendo Switch. All of these games offer interesting takes on their respective genres, offering a little bit of something for everyone. Bad North combines real-time tactics and rougelite strategy as players defend against Viking invaders. Morphies Law is a team-based shooter where your size affects your abilities, but bigger isn’t always better! And in Prison Architect, you have to overcome the challenges of constructing and managing a maximum-security prison – not the typical focus of a simulation game. To view the video in its entirety, visit https://youtu.be/qNUSrhEEvL0. Nintendo Switch is full of creative indie games from talented Nindie developers – with more games coming to the system every week. To help keep up with all the recent Nindie news, here are some additional updates about indie games on the way, games that recently released and fun news about the world of independent game development you might have missed. Indie publisher Devolver Digital has been launching multiple games on Nintendo Switch this summer – or as the hip kids are saying on social media, the #SummerofDevolver. To close out the summer, Broforce fist bumps its way to Nintendo Switch on Sept. 6, while The Messenger delivers its slick 8- and 16-bit action on Aug. 30. If your Nintendo Switch backlog is not already long enough, some recent notable indie launches on Nintendo Switch include Overcooked! 2 from Team17, Dead Cells from Motion Twin, Minit from Devolver Digital, Salt and Sanctuary from Ska Studios and Flipping Death from Zoink Games. A tasty episode of Nintendo Minute cooked up some fresh gameplay and spicy tips for Overcooked! 2. The developers of Overcooked! 2 were interviewed about their chaotic and fun new game on a recent episode of the Nintendo Power Podcast. Kill. Die. Learn. Repeat. That’s your motto when playing the challenging Dead Cells, and this animated video does a good job of illustrating it. For more information about all the great Nindies on or coming to Nintendo Switch, visit https://www.nintendo.com/games/nintendo-switch-nindies-hits. The mass stealing multiplayer shooter Morphies Law by developer Cosmoscope is coming to Nintendo Switch today – August 20th – for 19.99$/€ as announced by Nintendo during today’s Gamescom 2018 Indie Highlights showcase. Morphies Law will also be coming to Steam for PC later this year. In Morphies Law, with each weapon hit you grow and your enemy shrinks. Land a headshot and your enemies head will shrink while yours grows, pull off a bunch of leg shots and see where your giant legs can take you, or use your tiny body to hide in secret passages, ready for an ambush. Discover a wide mix of weapons, plugins, modes and maps where skill is not expressed by kill-death-ratios, but by your body size. From sinking buildings to rotating horizontal hamster wheels, you’ll have to learn how mass affects every map to master the game and become a giant. Learn to adapt your strategy to your body shape, build your perfect weapon out of weapon parts, unlock wacky Morphie Plugins, figure out crazy team strategies and discover more surprises. 4v4 mass stealing online multiplayer shooter. Up to 8 player local multiplayer. Mass stealing – each weapon hit transfers mass from the body part of the target to the same body part of the attacker. Self balancing – skilled players get bigger and easier to hit, beginners shrink and become difficult targets. 8 distinct body parts that can grow and shrink independently. Each body part controls a specific action, which is affected by size. 8 different powerful Plugins affected by size, which allow you to create unique strategies. Make your own weapons to fit your playstyle. Transfer mass within your own team with friendly fire for advanced strategies. 4 maps, each with a unique mass-related mechanic, and all maps are designed to give advantages to different body types – for example small players can hide in tunnels and big legged players can jump onto high points. 3 game modes built around the game’s unique mass mechanics. Customize your Morphie with faces (you can even make your own! ), bodies and emotes. 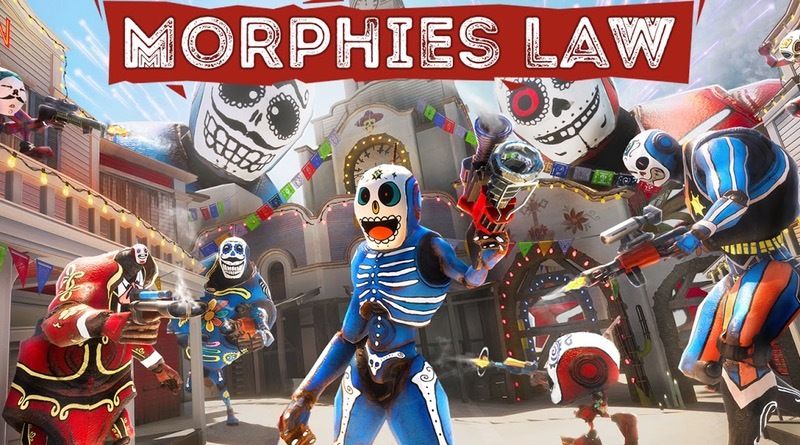 As a special surprise, during the first two days after the Day One Patch releases later today, players of Morphies Law will also get access to the limited edition Baby Face skin that will only be available for two days after launch. Players will have to head into the game and enter the code earlymorphie. Bad North is a beautifully-crafted, minimalistic, real-time tactics roguelite game where you lead a rag-tag group of island folk as they flee the relentless viking hordes. Progress through a series of procedurally-generated islands, fending off nordic raiders and gather what resources you can, before moving on to the next fight. Protect the nobles and commoners you meet along the way and recruit them to your cause – you’ll need their numbers in the conflict to come. And keep fighting. Not for power or riches or glory, but for the hope that one day you can live a peaceful life again. Charming Brutality: The tiny islands and adorable soldiers belie the true violence of war. As each level progresses, the landscape is soaked in the blood of your friends and foes, reminding you this is truly a fight for survival. Deceptive Simplicity: Positioning is everything! You control the broad strokes of the battle, and your soldiers do the rest. Holding chokepoints, reacting quickly and knowing when to retreat are the keys to victory. The balance always rests on a knife edge. Accessible Depth: Hiding behind simple controls are layers of complex systems, with every soldier individually simulated. Tactical mastery of Bad North comes from feeling out these systems and observing soldiers’ behaviours, rather than crunching numbers.